Welcome to our ‘Machines for Sale’ section of the website, here you will find a vast amount of information on the machines that we have available to purchase. We in partnership with a leading manufacturer have a wide variety of machines available to suit any budget. 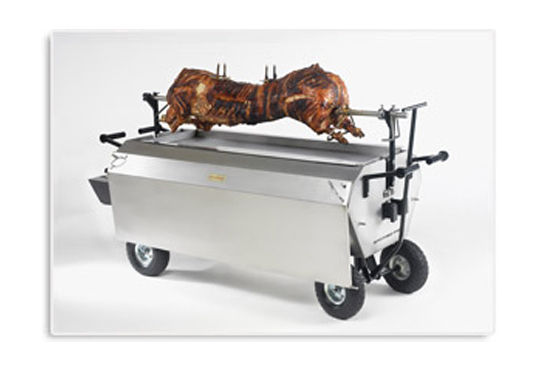 Maybe your thinking of starting your own catering firm, think a hog roast would go well with your pub or restaurant or just want a new toy to impress for friends at you next party, well we have all the bases covered. The machines we sell have now become industry standard equipment and are fully CE marked. All machines and parts are a stock item and we have service engineers available all year round should you need any servicing work completed. We have some fantastic deals, so why not give us a call or fill in the contact us from we will instantly send over our brochure and price list and arrange for one of our sales team to give you a call at a time to suit you. 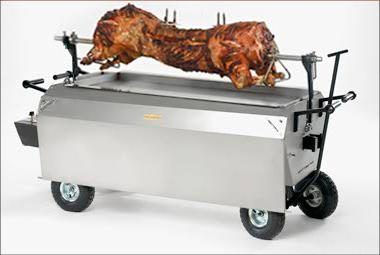 Hog Roast – this turns the machine into an oven. The pig sits on a big tray and doesn’t rotate. The advantages of this method of cooking are it is effortless and takes very little skill and time to produce outstanding results. Furthermore the lack of moving parts makes the machine ideal for the hire market a very profitable business can be created by hiring the machines out. Finally because the machine is turned into an oven it becomes completely versatile and means almost anything can be roasted in the machine this includes, whole pigs, lamb, joints of beef, turkeys, chicken, jacket potatoes and much much more. 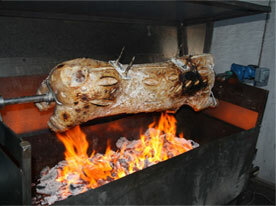 Spit Roast – this is the traditional method of cooking a pig on a spit. This is the rotating version of the machine and uses a 240 volt motor to slowly rotate the pig while it cooks. The advantages of using this machine are the results it produces, the meat is second to none and furthermore the rotating version really adds a sense of theatre to the event. The Professional Range – these are the smallest version of our machines perfect for home use and small businesses such as pubs or restaurants looking to offer sometime a little different to their customers. 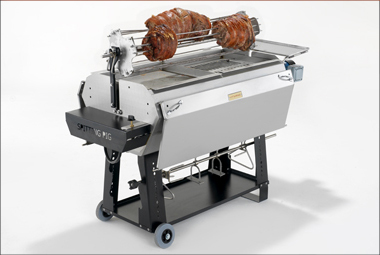 The Commercial Range – these are our most popular machines that can cook full size pig and are aimed at someone looking to use the machine as a commercial unit possible as a new business or as an add on to an existing catering venture. The commercial range comes in a variety of model to suit any business need and budgets. The Restaurant Range – this version of our machine is designed to be built in to restaurants as a functioning kitchen unit and as a centrepiece for all our customers to watch. The Charcoal Range – we also have a traditional range of machines that uses charcoal for that authentic and unique taste.